Gaspereau Vineyards is a picturesque 35-acre vineyard in the Gaspereau Valley. It has earned a reputation for making outstanding wines under the care of European-trained, Nova Scotian born winemaker Gina Haverstock. Gaspereau Vineyards specializes in fruit-forward, terroir driven white wines, and smooth reds as well as traditional method sparkling wines. 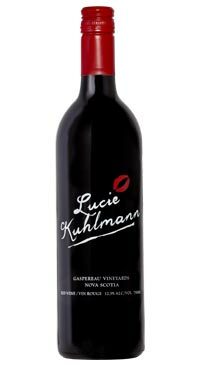 Lucie Kuhlmann is one of Gaspereau Vineyards’ signature red grapes. The wine is aged in French oak barrels, adding a pleasing smoky dimension to the wine’s deep dark fruit flavours. It is bold and supple on the palate.